How to Make Apple Pie moonshines’ Outdoors series Part Two. 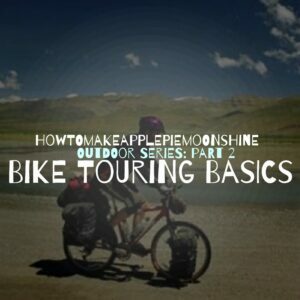 Essentials to know for any type of biking travel trip. Bike touring is known for its ability to see and visit new places in a new way. The variety of touring types accommodates a wide range of skill levels and interest in picking up another hobby this summer. Here at howtomakeapplepiemoonshine we want to inspire as well as make sure you are fully prepared to enjoy your next adventure. 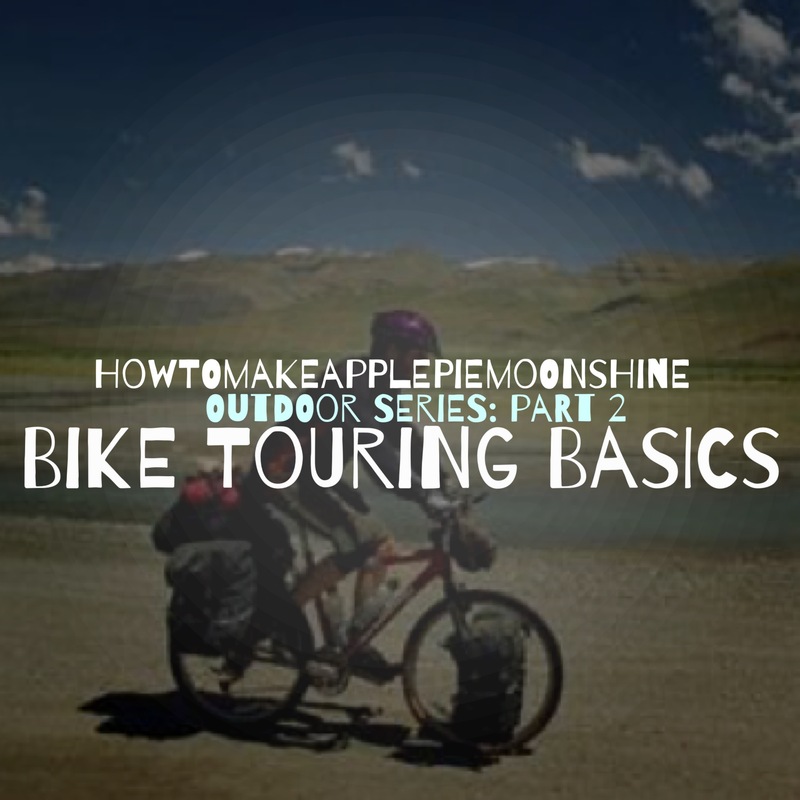 Weather it be hitting the trail or hitting the road we hope you’ll keep these helpful tips and tricks in mind when considering your first bike touring adventure. The biggest components of bike touring come from preparation like all outdoor adventures of course. In this article we will be focusing on the best packing tips and tricks might be to help yall get out there. Bike touring adventures come in many different forms, weather they be guided or taken solo. The fun is all the same. Touring generally means staying away from your “home” for more then 2 nights. There are many different types of touring, you can travel as easy and or as challenging as you like. Selecting a tour that is up to your skill level of expertise and willingness for a challenge. Supported tours are a great way to start your touring experience. Supported meaning that there are cars, buses, vans to carry a large portion of your gear and food. Everyone travels the same amount of miles a day but it great to get to know people and learn all the tricks of the craft from the wide variety of members. This type of tour really seems like the best way to start off because of the overall challenge but also one has the support of others to motivate you as well as be there if things don’t go as planned. These tours can definitely draw a large crew and can end up being thousands of riders. If huge crowds turn you off there are also a lot of more exclusive supported tours that have a limited capacity and allow for a bit more flexibility in travel. “Self-Sufficient” touring is a great way to get out on the road and have free range to do what ever you please. Self-sufficient riding requires a lot of packed gear and a bit more strategic planning. Pannier and saddle bags are key for this type of travel, packed from front back and the sides, these packs are built to hold a load on top of a sturdy and longer bike set to carry all of ones clothes, food, water, camping gear and tools that make a long haul trip possible. Although a fully packed bike may look intimidating and heavy, if packed right it turns out to be a very easy way to travel. The greatest part about being able to take a solo trip is that you can go wherever whenever you’d like. Often solo campers just camp on the side of the road, in RV parks and or other national park camping spots. There are no limits to what you want to do on a solo trip. Many people to opt for a combination of camping and “credit card touring” (see below), trading a night or two of the camping lifestyle for prepared meals, a hot shower and a comfortable bed now and then. The newest and most popular trend in bike tours these days is the idea of Self-Guided tours. A self-guided tour is a great way to explore foreign regions and take your time but still maintain a support system within a touring program. These tours are really nice especially if you are traveling as couples or groups. The tours start at a key checkpoint, and then you are self guided to the next destination or check point. At each destination they will have taken care of your luggage transportation, accommodation and food. The flexibility component is the largest appeal; you have free range to pack essential so that you can easily take as long as you want exploring each region before reaching your next destination where all of the rest of your belongings will safely be awaiting your arrival. “Base Camp Touring” is a great way to trade out the road for some trails and tackle a mountain biking adventure. Base camp touring is essentially placing all of ones belongings in one central campsite allowing you to tour all day and return to the same campsite each night. Base Camp Touring largest attraction is that one can really explore and discover what one given area has to offer for a couple of days. It’s a great option for group trips. Offering flexibility to all different skill levels. It is the lightest and easiest way to travel but it is also the most costly based on the extent of paying for accommodation and food a long the way. One can pack a small amount of gear simply including clothes, toiletries and a few essential bike tools. The credit card aspect covers staying in B&Bs, hotels and dinning at new places other wise missed along the road. This type of touring is generally way more relaxed and offers the ability to be a very carefree way to travel by bike for all skill levels. Packing for a multi-day trip is going to be the most essential part about exploring on your bike, supported or solo. There are some excellent reads out there on bike touring tips but I am just going to cover the essentials of packing your bike for any trip. Be Careful of over packing. Minimizing your load really helps make things easier to travel. Tool kits are key. Carrying a small repair tool kit filled with extra tubes, cycling multi-tool, pump and patches. Bike Locks, Maps or GPS devices are also must haves. When selecting camping gear such as tent, tarp, sleeping bag and pad and cooking gear, aim for the lightest weight gear. Also packing this bulk stuff towards the back of your bike will definitely help with weight distribution. When packing clothing it is important consider what types of touring you are doing, packing for a credit car tour is much different then a full on camping solo trip. Packing lightweight, quick dry layers are great for both daily biking but adding a couple of more casual night clothes that can be layered offers a diverse way to switch up with the climate as well casual night attire. Personal care items are all dependent, again on the type of tour, select supplies wisely and trying to minimize any way possible. Most importantly do not skimp out on food, always pack enough or more to fuel your daily need regardless of the tour. On the road or trail you are working hard and burning a lot more energy then usual so having accessible food and water is important always. After you have picked up all your gear balancing your load with rack pack is important. Maintain a 60/40 back to front distribution is good rule to kick of the basics of packing. It is important to make sure to take a fully packed and distributed test ride a couple of times before your actual touring trip making sure that all of the weight is not pulling you forward or backwards in an unsafe way. Testing new or gently used tools is a great way to make sure that you don’t get stuck with gear that is broken or otherwise useless when making your way on a physically taxing trip. All the prep work doesn’t sound that enjoyable but being prepared and organized pays off tremendously. Touring is quite the liberating and mind opening experience. If you’re anything like me, I am always looking for new ways to adventure and with all of the types of tours out there I am certain any one can find a tour that would be great to kick off your first touring adventure.